“Attractive medium bodied with blackberry, mulberry flavours. Clean, fresh, multi-layered. Some savoury notes, roasting pan juices, juicy, spicy with a gentle grip and drinking well. A wine of substance.” Peter Forrestal, 9 January 2018. 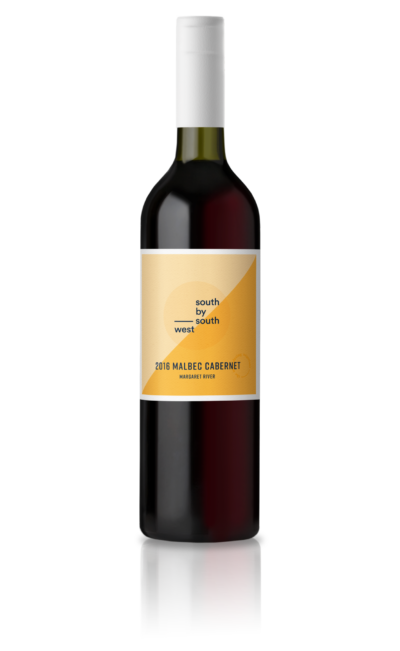 Our 2016 Malbec Cabernet is a diversion from the regionally popular Cabernet Merlot blend. The ripe fruit of the Malbec drives the flavour, while the Cabernet provides lightness, aromatics and overall delicacy to the blend.This wine is medium bodied with the Malbec showing off ripe fruit, and Cabernet Sauvignon providing a level of sophistication, while producing a finish with generous chalky tannins. The inaugural vintage for South by South West was about giving our love to the ‘little guys’; the varieties typically used for blending as opposed to the main act. These strivers never get the attention they deserve, so joining this vintage release of the Petit Verdot, Merlot, and Viognier is our Malbec Cabernet, which is a diversion from the regionally popular Cabernet Merlot blend. We decided to use Malbec as chief to bring an Argentinian feel to the wine. The ripe fruit of the Malbec drives the flavour, while the Cabernet provides some lightness, aromatics and overall delicacy to the blend. This wine is a little heavier than a medium bodied wine and shows off some great fruit and generous chalky tannins. This was Liv’s favourite of the reds this vintage, and when you taste it you’ll see why. The weather was near-perfect for this vintage, with abundant winter and spring rainfall, little or no rain from November until mid-March, and conditions that were not too hot. These are textbook conditions for ripening, especially for the key Bordeaux varieties. The birds were arch enemy as always, yet the berries that survived the attacks were treated to beautiful sunny days. Both Cabernet and Malbec raced for ripening. Cabernet was picked first from Alexanders Vineyard with good, balanced bunch numbers and small berries, closely followed by Malbec from the Triside and Rivenleigh Vineyards in the second week of April, picked at 13.6 Baumé. Both varietals were sourced from the warmer and drier areas of the Margaret River sub-region Carbunup, where consistently ripe, flavoursome, high quality fruit provided a strong starting point for the winemaking process. The berries were sorted through and crushed into stainless steel fermenters and inoculated for primary ferment. The must was initially gently pumped over three times a day during fermentation and allowed to reach higher temperatures, and then less frequently as alcohol volume increased. The ferment was allowed to reach as high as 30°C at the height of ferment. After an extended time on skins the wine was pressed to French oak barrels and inoculated for malolactic fermentation. The wine was allowed to mature in oak for 18 months and was racked at regular intervals. Prior to bottling the final blend was decided, with Malbec accounting for 75% of the wine composition, Cabernet 15%, and a small amount of Petit Verdot and Shiraz, providing that little something extra. In a glass the wine presents with a mysterious, dark inky core with a lighter purple hue. The nose shows lifted aromas of blackcurrant and some violets. The palate is rich and smoothly textured. The Malbec fruit combines with the smoother Cabernet, which contributes classic layers of dark plums, earthy cedar, and a touch of tobacco thanks to the French oak. This wine has a little more complexity mid-palate and a rich texture. We aim for minimal intervention to let the fruit express itself, yet there are certain things we do need to maintain the quality and integrity of this wine. We’ve added minimal sulphites to stabilise the wine and ensure its shelf life. It has also been fined with the aid of egg whites and skim milk products to remove harsh phenolic compounds. We use this method as opposed to other by-products as it is extremely gentle in nature and does not strip flavour nor character from the wine, creating a final, high quality polish.